The Swedish National Space Board, (Rymdstyrelsen), is responsible for national and international activities relating to space and remote sensing, primarily research and development. In 2014 they decided to fund the MISU satellite project MATS. On 5 March 2014 representatives from the Swedish National Space Board, SNSB, visit MISU to learn more about the activities carried out at the Department. SNSB funds a large part of the work in the Atmospheric Physics group, for example for the rocket research, but also funds several other scientists at MISU including work related to aerosols, evaluation of climate models and oceanography. In 2014 SNSB decided to fund the Swedish research satellite MATS, for which MISU has the scientific responsibility. 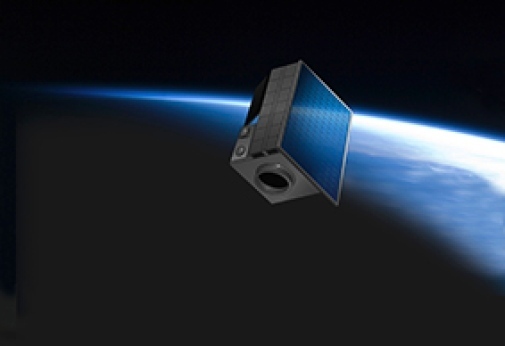 MATS is a collaboration with Chalmers, KTH and partners in Swedish space industry. The acronym MATS stands for Mesospheric Airglow/Aerosol Tomography and Spectroscopy. If all work goes as planned, MATS will be launched towards the end of 2017. An introduction to the MATS-project is available in form of an interview with SNSB's Director General, Olle Norberg, in Rymdkanalen. Read also an article in Dagens Nyheter about the project, and an article on the Stockholm University web site here. The MATS-satellite. Source: The Swedish National Space Board. The Swedish space programme is carried out by means of extensive international cooperation, in particular through Sweden´s membership of the European Space Agency, ESA. SNSB's responsability for international activities includes the Swedish involvement in ESA as well as bilateral cooperation within space. Most of the activities funded by the Swedish National Space Board are carried out in cooperation with other countries.